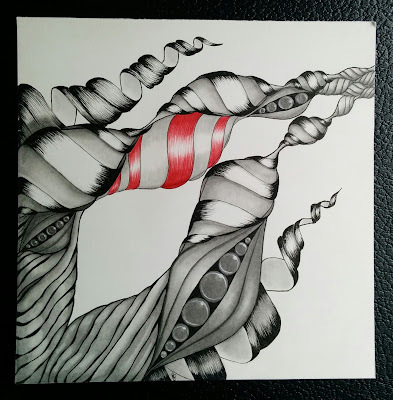 This week the Diva told us how she accidentally picked up a red pen in the middle of creating a black and white Zentangle tile. She challenged herself to push past her first reaction of "It's ruined!" and to keep going to see what would happen. Allowing herself that freedom of exploration, she ended up creating one of her favorite tiles. From that grew Diva Challenge #272, where we are asked to add some red to the traditional black and white motif, to have fun, and to leave some room for exploration. 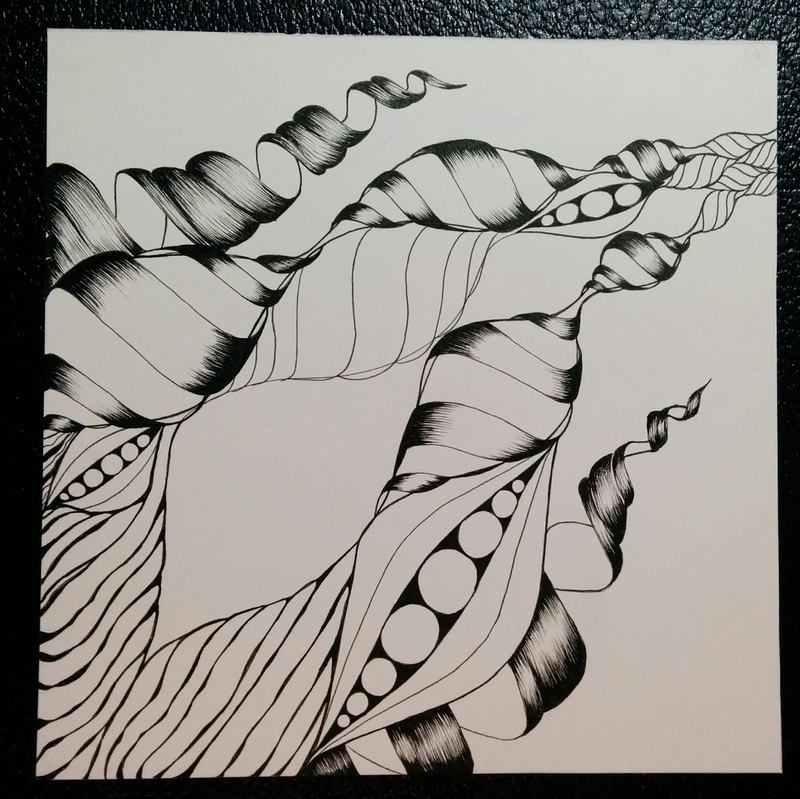 I started my tile this week by exploring a new to me technique for shading using hatching strokes with my ink pen. I used a very smooth bristol paper for this tile, which really let my pen flow over the paper with a minimum of drag. Delicious! Next I added some graphite shading, which is a whole new experience on such a smooth paper. The first layer of 2H graphite went down so smooth and buttery it felt like cheating! But after that I struggled a bit with my HB layer. I am used to having much more tooth to the paper. There is a learning curve, to be sure. But I followed the Diva's example, and I kept going to see what would happen. Then lastly, it was time to add that pop of red. Wow! 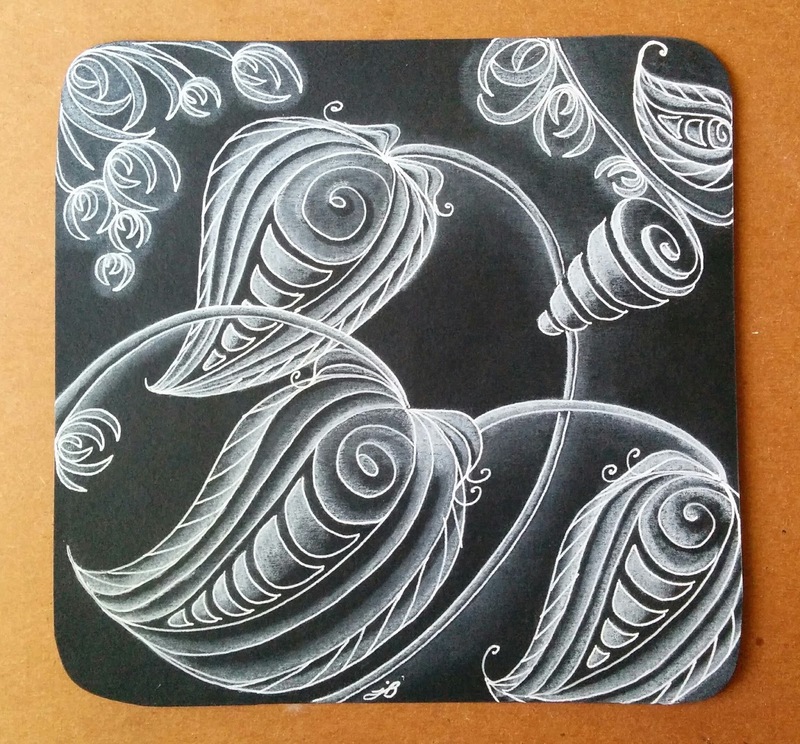 I wanted to keep up this spirit of exploration when I was working on my tile for the It's a String Thing Zensquicentennial Challenge, so I picked up that coal black drawing paper and my white gel pen and headed back into unfamiliar territory. I can see myself making progress with each new pancake! We've all heard people talk about the power of positive thinking and keeping an open mind. When the Diva resisted that first reaction to the accidental addition of red into her black and white tile, she made a conscious choice to keep going and see what would happen. She was thinking like an artist. I think the ideas on this list can be applied to so many parts of our lives, not just when we sit down to draw or paint. So the next time you take on a challenge, will you think like an artist? Your DIva tile is amazing, I like your special way of drawing, your choice of tangles, your shadow's and the red in it, very very nice!!! Thank you for your kind words, Ria! 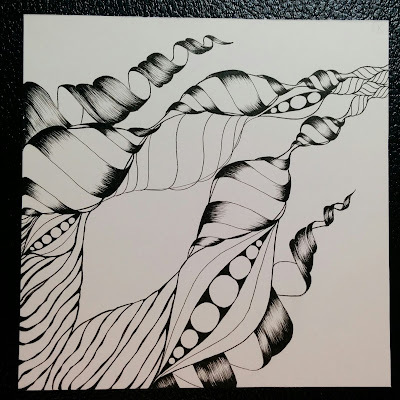 I've been enjoying looking for tangles that have similar shapes or a similar feel and putting them together like musical variations on a theme. And adding that pop of red was so fun! Thank you, Cindy. And I pretty much believe that everyone is an artist at heart, they just might not know it (yet)! Reading through this list, it seems I'm more likely to think like an artist at work than I am in front of blank paper or a canvas. More fun in art!! Hey sweets! I see a lot of synergy between this list and the ideas in growth mindsets. I bet you're just more accustomed to applying that thinking in a work environment. Same for me, for a very long time. It's a process! Both tiles, fabulous, BUT that black tile is to die for! I saw it while scanning Adele's 150 tiles and HAD to check out your blog! Glad to say your on my list now! I'll be checking out your pancakes!